This Puget Sound Book Artists Blog site is no longer current. Slide Shows, Videos, and More! What exactly is a book? Is it simply a container of information? An object with pages and covers, and a narrative of some sort? A collection of pictures and words? A small sculpture? 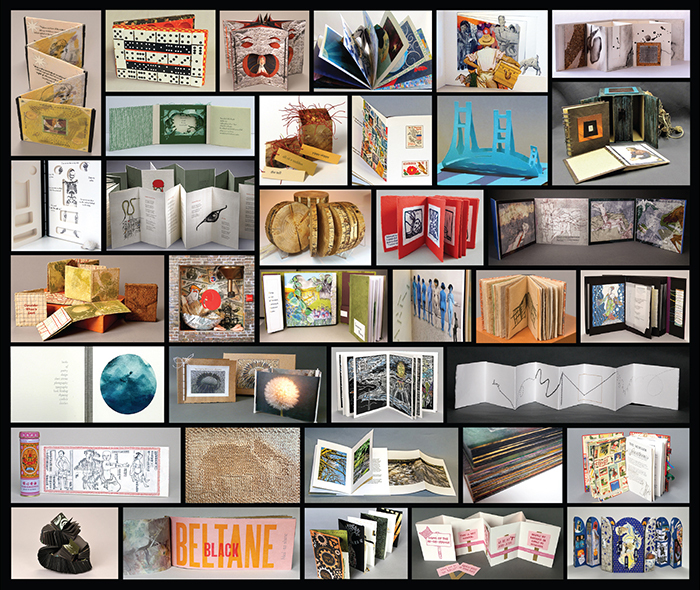 The 8th annual exhibit of the Puget Sound Book Artists explores all of these possible definitions and more. The participating artists play with the form of a book. They use traditional formats and bindings in new ways. They make books using all sorts of media and materials; origami folding, popup pages, drawing, painting, printmaking, knitting, sewing, wood and found objects, to mention a few. This year Puget Sound Book Artists is celebrating their 8th exhibition and it will amaze and astound you. Each book is a fresh take on what a book can be and how its creator thinks and imagines. Some artists use the idea of the book to explore philosophical concepts. For example, Debbie Commodore asks questions about the nature of time with her Chronos and Kairos calendar. “What if the chronological year was shaped like a book that had not been written? And what if this book pushed the traditional book form…?” And she has shaped an interactive book/calendar that includes the possibilities of both Chronos and Kairos. Other books are visual expressions of complex emotional states. Mary Preston’s piece “A Work In Progress” is a carefully detailed “chronicle of loss” and “homage to a beloved family”. It conveys at the same time what is highly personal, yet universal in feeling. Social commentary is another strand in this show. Lynn Olson has made a 3D visual political analysis and comment entitled “Tax Reform: Feather Your Nest” in one small box. And some artists celebrate and share observations of the natural world. 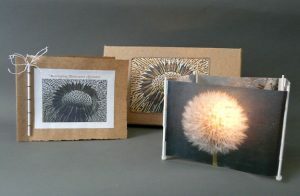 Jan Ward’s book “Illuminating Taraxacum officinales” shows a close up of the humble dandelion, actually lit from within, making the plant look like a precious treasure, rather than a lawn pest. We, the curators, are delighted and inspired by the great diversity of approaches and technical skill shown in these works. Puget Sound is committed to being accessible to all people. If you have questions about event accessibility, please contact 253.879.3236, accessibility@pugetsound.edu, or pugetsound.edu/accessibility. Come and meet other book artists. Bring your favorite art book to share. Bring something you are working on. Bring an idea or a problem you’ve encountered in the process of making your work. Or bring what you plan to enter in this year’s PSBA Exhibition. This is a great opportunity to share and get feedback. 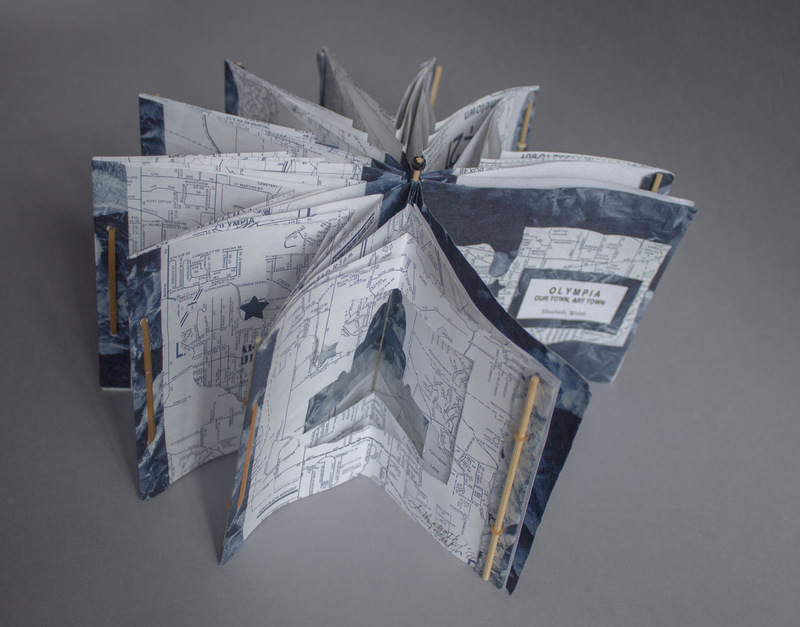 Jane Carlin will mark the occasion of the Al-Mutanabbi Street Starts Here exhibit by sharing the artist book, “The Librarian of Barsa: A True Story from Iraq” by J. Winter. We Hope you can join us. 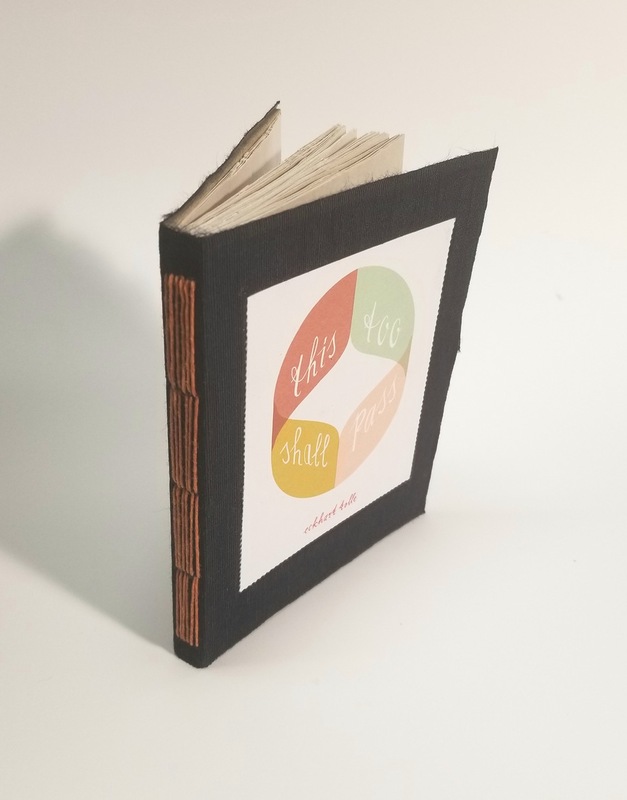 Puget Sound Book Artists (PSBA) is a nonprofit organization comprised of individuals from all areas of the book arts field for the purpose of creating a spirit of community among book artists and those who love books. The organization strives to increase educational opportunities for individuals as well as organizations, fostering excellence through exhibitions, workshops, lectures and publications. The organization sponsors a yearly members’ exhibition, lectures, and workshops where you can explore,create and share with others. 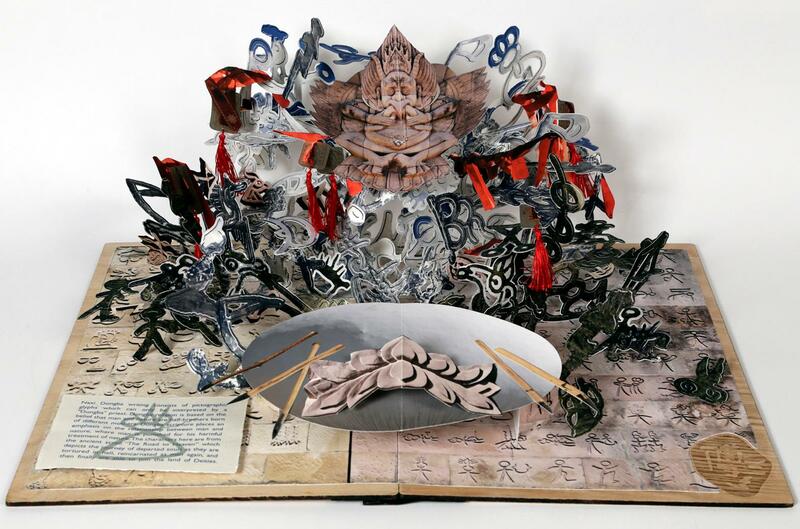 Thursday, Feb 15-We are excited to sponsor a lecture and workshop with artist Colette Fu. The lecture is Thursday evening, Feb 15 (Library Room 020) and the workshop will be held the same weekend. More information will be posted on the PSBA website in the near future about this workshop. Follow our page and learn about calls for art, information about workshops and lectures, interesting articles about book and paper arts, and news from book organizations and galleries from all around the world. Blogs: Highlights current information for book artists. 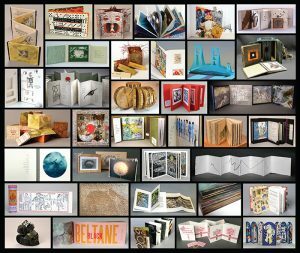 Resources Page: Lists book arts websites, blog sites, books, book dealers, newsletters, galleries and videos. Members Page: lists current members and allows members to post a short description of their work and a link to their website. This is a great way to get to know each other, so please send us information to post. Colette Fu received her M.F.A. 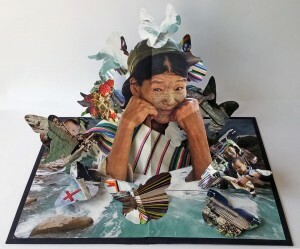 in fine art photography from the Rochester Institute of Technology in 2003, and soon after began devising complex compositions that incorporate photography and pop-up paper engineering. She has designed for award-winning stop motion animation commercials and free-lanced for clients including Vogue China, Canon Asia, Moët Hennessy–Louis Vuitton, and the Delaware Disaster Research Center. 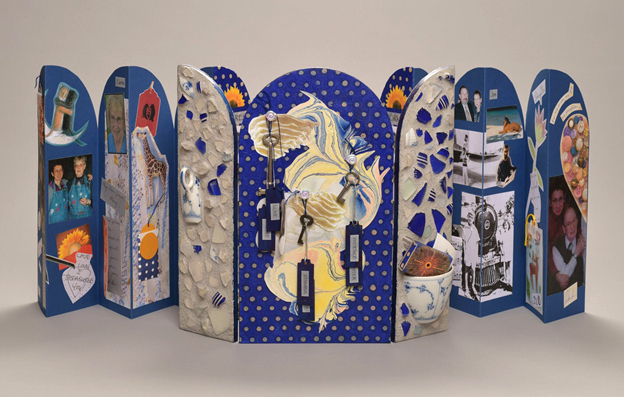 Her pop-up books are included in the National Museum of Women in the Arts, Library of Congress, Metropolitan Museum of Art, the West Collection, and many private and rare archive collections. In 2014, Fu attended a 6-month artist residency at the Swatch Art Peace Hotel in Shanghai, where she continued her We are Tiger Dragon project, an extensive visual exploration of China’s ethnic minorities. There she also designed China’s largest (single-spread) pop-up book, measuring 2.5 x 5 x 1.7 meters high. 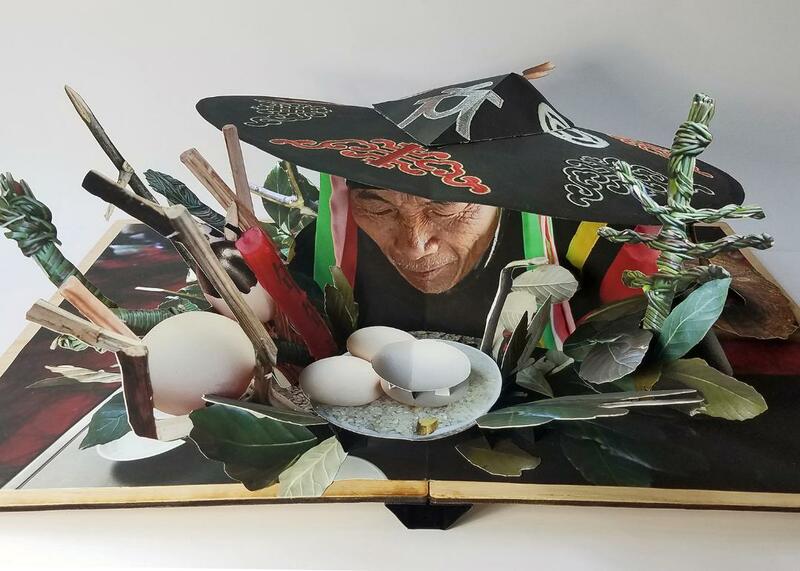 Pop-up book structures can be used to make engaging works of art for any age, from greeting cards to animations to kinetic sculptures. 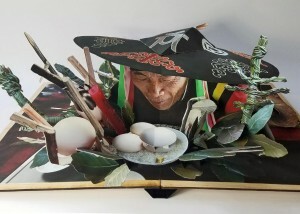 In this 3 day intensive workshop, participants will learn the many basic structures of pop-up paper engineering including angle folds, platforms, and pull-tabs, and how to incorporate them into unique pop-up books, cards, and works of art. Complex pop-up works are created from a combination of basic mechanisms enhanced by your art, playfulness and imagination. All levels of experience are welcome. I make one-of-a-kind collapsible artist’s books that combine my photography with pop-up paper engineering. Pop-up and flap books originally illustrated ideas about astronomy, fortune telling, navigation, anatomy of the body and other scientific principles. This history prompted me to construct my own books reflecting ideas on how our selves relate to society today. Growing up (in New Jersey), I was not proud of my Chinese heritage. After college graduation, I went to my mother’s birthplace in Yunnan Province in Southwest China to teach English. Literally translating as “South of the Clouds,” Yunnan is China’s most southwestern Province, sharing borders with Tibet, Burma, Laos, and Vietnam. With snow-capped mountains to the Northwest, and tropical rain forests to the South, Yunnan is rich in natural resources and has the largest diversity of plant life in China. This diversity extends it its population as well. I taught at the Yunnan Nationalities University in the capital, Kunming. While in Yunnan I discovered that my great-grandfather had not only helped establish the university where I was teaching, but was a member of the powerful black Yi tribe, and governor and general of Yunnan during the transitional years of WWII. I stayed in Yunnan for three years; it was these experiences that helped me find a new sense of pride and identity and encouraged me to pursue a profession as a photographer and artist. With the help of a Fulbright fellowship, I traveled once again to Yunnan, specifically to photograph for a pop-up book of the twenty-five ethnic minority groups that reside there. 25 of the 55 minority tribes of China reside in Yunnan and comprise less than 9% of the nation’s population, with the Han representing the majority. Many people inside China and most people outside are unaware of this cultural richness. While I am directly unable to help these groups preserve their identity and ways of living, I can use my skills as an artist to spread knowledge and provide just a brief portrait of their existence. As I grow older I start to understand the importance of preserving one’s identity and culture, and the significance of learning one’s roots. In 2014, with the help of a Leeway Transformation Award and the Swatch Art Peace Hotel residency in Shanghai, I returned to China to extend my project outside of Yunnan Province. For 6 months I traveled between Shanghai and select minority areas in Inner Mongolia, Northwest Xinjiang Province, Hunan, Guangxi, Guizhou and Zhejiang Provinces. I spent this half of the year photographing the minority areas with the goal of making pop-up spreads when I returned back to the US. My pop-ups are a way for me to speak and inform; the real and implied motion in the pop-ups link to a temporal element and an inevitable corollary is to awe and unsettle. Constructing pop-ups allows me to combine intuitive design and technical acuity with my love of traveling as I try to understand the world around me. 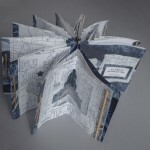 With pop-up books I want to eliminate the boundaries between people, book, installation, photography, craft, sculpture. In this workshop you will be learning how to make a cradle, for which you can use right away to make a multi-signature pamphlet stitch binding. You will learn how to construct a book made with multiple individually sewn pages and then pamphlet stitch the pages to a cloth cover. This style of book lays flat when open and the cradle will be able to come apart so it’s easy to store. As a part of the PSBA Fundamentals series you can also expect to learn the fundamentals of folding, scoring, sewing signatures and about sewing tools and materials. Workshop fee ($15) paid to PSBA on day of workshop. calligrapher/paper & book artist since 1978, attending many international calligraphy conferences. Elizabeth is also the founder of the Olympia Calligraphy Guild, Nib ‘n’ Inks, in 1980 and has taken bookbinding master classes with Shereen LaPlantz, Bonnie Stahlecker, Elsi Vasdall-Ellis, Don Guyot, Suzanne Moore, Kevin Steele, Laurie Doctor, and other calligraphers. complete the structure with piano-hinged covers. pencil for your own personal notetaking. Provided by instructor: Canson paper, needles & thread, skewers, rubber bands and instructions. ($15) paid to PSBA on day of workshop. Checks (made out to PSBA) or Cash (exact change only). Space is limited to 9, registration required. Sunday, November 19, 2017 PSBA Last Salon of the Season: Artist Residencies Come and be a part of the discussion with a panel of artists who have participated a variety of programs. Time: 3-4:30pm. Location: University of Puget Sound, Collins Memorial Library, Archives Seminar Room. Saturday, November 4, 2017 PSBA Fundamentals Workshop The Codex 101: Single sheet coptic. 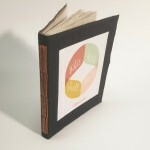 PSBA Member Gabby Cooksey will be presenting this workshop on how to create this book form. Time: 1-4 p.m. Location: 2926 S. Steele Street 2nd floor, Tacoma, WA. Amy McBride: Arts Administrator, City of Tacoma. Amy will share insights into the work of the Tacoma Arts Commission and the importance of arts organization and leadership in our community. Stay after the official meeting for a presentation by Suze Woolf. Suze Woolf will share insights about how she uses graphic software and laser cutters to enhance her artistic expression. She will talk about the process from start to finish and have photos to demonstrate the use of software and discuss how she works with Fabrication Studios to achieve the final results.